As you walk down Bond Street, past the rather spooky life-casted windows of Louis Vuitton, and the tourists sitting with Winston Churchill, there's a bright, glass-filled window on the right-hand side. The door is overlooked by a red awning and framed by a flag bearing the name of the owner in a distinctive, stylised font. The store is Marcus; its owner Marcus Margulies; and it sells dreams. Accompanied by fellow watchnerd GregD, I spent some time yesterday with Liam Chadzynski, exploring part of Marcus' immense catalogue of watches, clocks and pocket watches, including a display of Audemars Piguet pieces that form part of (probably) the most complete collection of complicated and rare AP's anywhere in the world. 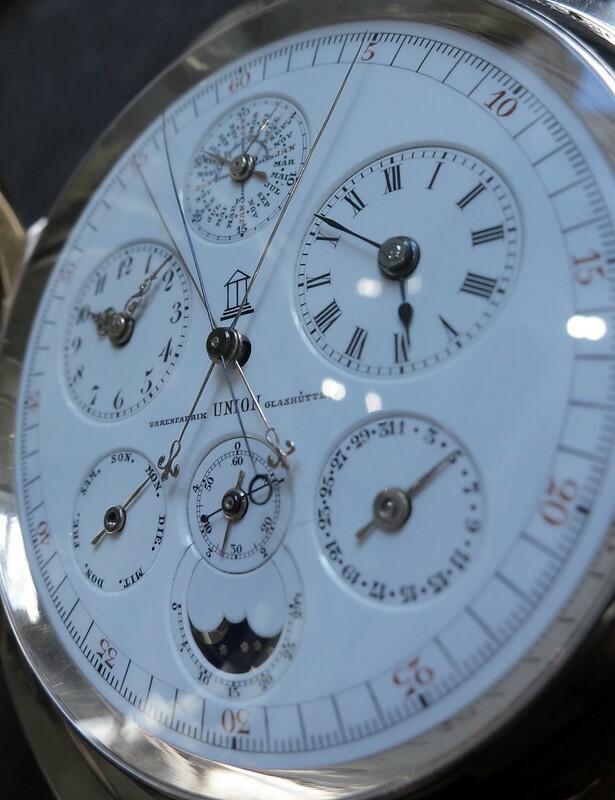 It's a quite staggering exhibition, and worthy of a visit by any serious #watchnerd. 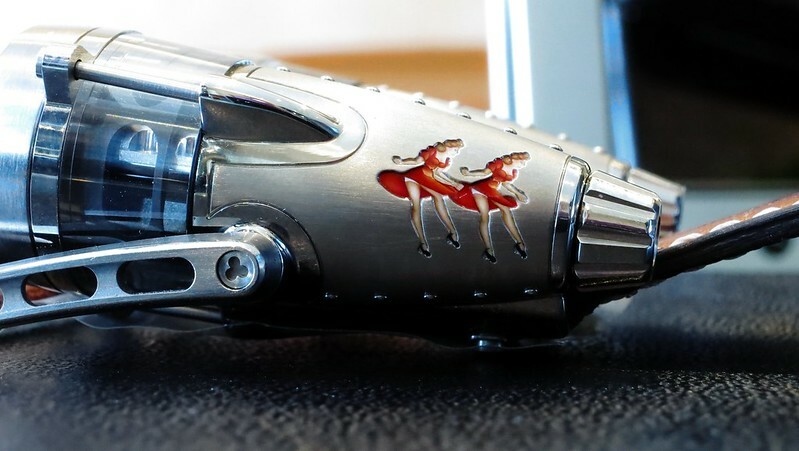 But to be able to see some of the unique pieces that Marcus has commissioned, along with some truly marvellous watches from some of the watch world's finest manufactures, was a rare treat. 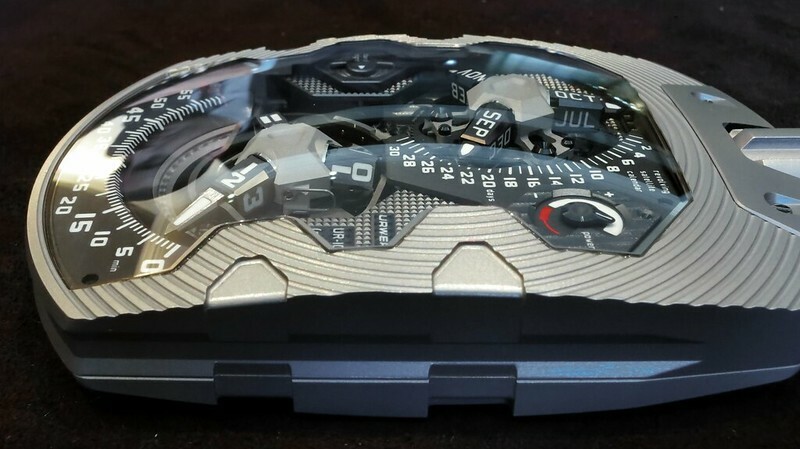 Out came watches from Greubel Forsey, MB&F, URWERK, as well as Alain Silberstein, Hublot and MCT. It was like an haute horologie tasting dinner. First up was a brush with history: the Union Uhr is described as one of the most complicated pocket watches and arguably the most important piece ever created by Audemars Piguet. Marcus purchased it at auction in 1993, apparently paying over seven times the estimate. The original case is massive - it weighs 0.4kg and is over 80mm across. So Marcus has a second (and, indeed, third) case made, that better suited the movement. It is unlikely that a pocket watch like this will ever be made again - Marcus believes that "the craftsmen do not exist today and the cost would run into millions." It's rare to see such an item; even rarer to hold it. To hear its exquisite repeater was unprecedented. From the 19th Century to the 21st (or should that be 22nd?). URWERK created the UR-1001 last year - a pocket watch that combines ten complications including a flying hour satellite indicator and retrograde minutes. On the back, there's a 100 and 1,000 year indicator - truly a watch for the next millennium. Then came the MB&F watches: a rose gold HM3 Frog Moonmachine; the HM4 Thunderbolt "Double Trouble"; and a HM2 Sapphire Vision. 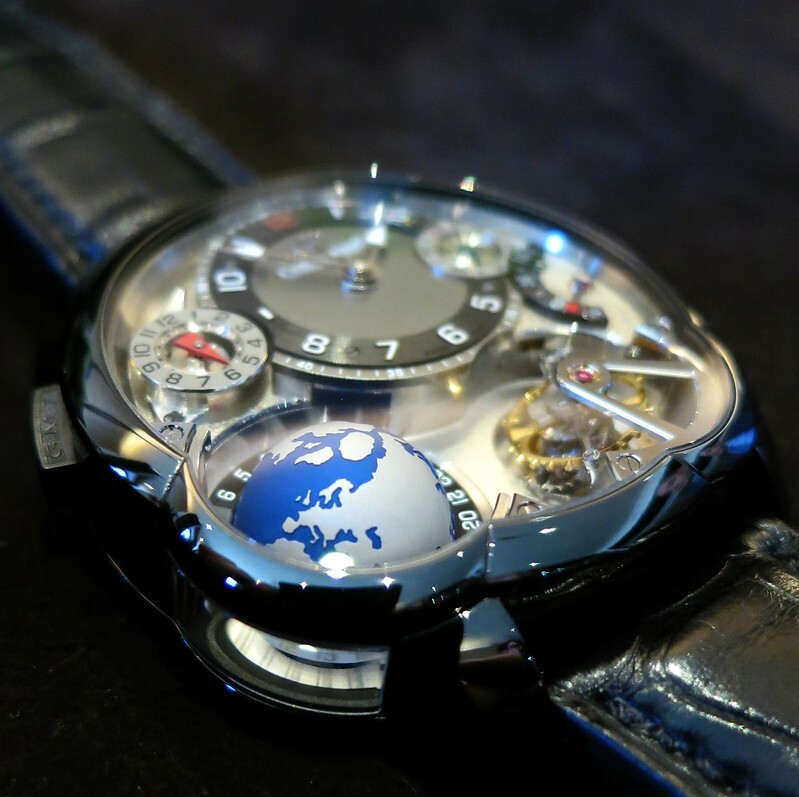 To see one Greubel Forsey might be considered lucky. To see an entire table full? Words began to fail me about now, as I busied myself trying to take photos to cover up the fact that I was practically speechless. First there was the full Invention Piece set - a collection of the three pieces in a special presentation case. It's difficult to describe these watches - part watch, part pure horological experiment. Phrases such as "quad tourb" and "24 second tourbillon" whizzed past my head as my companions discussed the relative merits of the inclined tourbillon. The GMT was absolutely stunning: UTC perceived as a rotating globe. And then a unique example, the Balanciers (previously 'blogged by Hodinkee during their short visit to London last week). It's the first (only?) 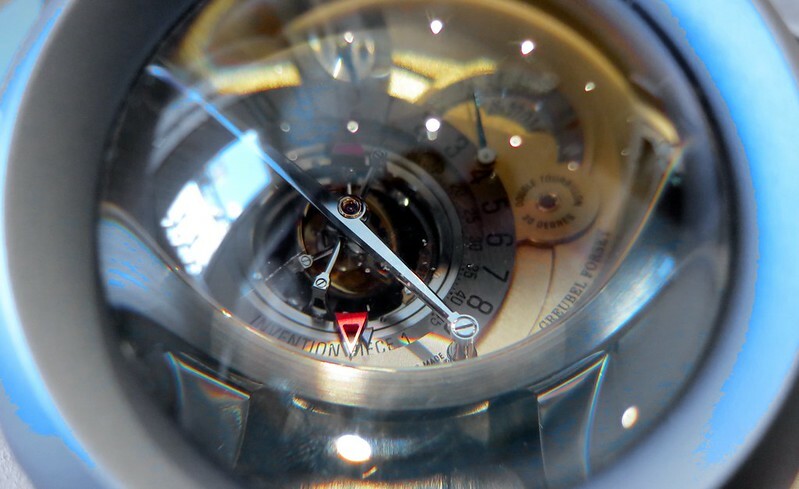 GF *not* to contain a tourbillon, and uses the average of two, separate escapements to show the blended time. This last piece is truly unique, and a wonderful example of the pieces that only Marcus can supply. This isn't just a watch is a "unique" case, or unusual finish. This is one-of-a-kind, never-to-be-repeated. An outstanding way to end a visit. Thank you to Liam, Alex and all at Marcus for letting me take a peak inside their world. Please do arrange to visit the Audemars Piguet Exhibition - it's full of fantastic jump hours, unusual chronographs and even the world's smallest minute repeater. More photos and videos can be found here. Here in the States there exists an expression fairly common among men of a certain age ( Gen X'ers, basically ) when they find themselves at once impressed and utterly gobsmacked. I simply can not believe this. Thanks for sharing these pictures. The Greubel Globe is my favorite! Completely agree re the GMT. Absolutely incredible. That one is in DLC'd platinum and the globe is titanium. I've got more. Will try and post some over next couple of days. Great pics! Those Greubels are astounding! I've been in there a couple of times and the watches they have blow your mind. As if that wasn't enough, downstairs they have a showroom complete with whisky and cigars! Perfect! New ATG event at end of October so we can all meet up again...? I remember. I lost you all on Bond Street (you'd b*ggered off for a drink). End-October works for me. Hallowe'en?